No1 Rosemary Water, a drink made with extracts from the herb, has had nine of its executions banned by the Advertising Standards Authority over a wide range of disallowed health claims. They include a video ad in which an elderly woman appears to age backwards after drinking the drink. The film stars 89-year-old Daphne Selfe, the world’s oldest-working model. It was created in-house, with creative consultant Simon Brotherson, formerly a creative director at Grey London. The ruling also covers five different print ads, two paid tweets, and the brand’s website. There were 19 complaints from members of the public over the ads, seen between April and October last year. The ASA also investigated whether the inclusion of the references to "the UK’s best botanical scientists" and "Dr Mark Moss of Northumbria University" breached the CAP Code prohibition on referring to the recommendation of an individual health professional. While Rosemary Water Ltd accepted that some of the claims it had made were prohibited, it did not believe all of them were. But the ASA disagreed. It ruled that the brand’s collection of ads had breached the CAP Code rules on food, food supplements and associated health or nutrition claims; misleading advertising; and substantiation; and ordered that the ads not be used again in the form complained about. 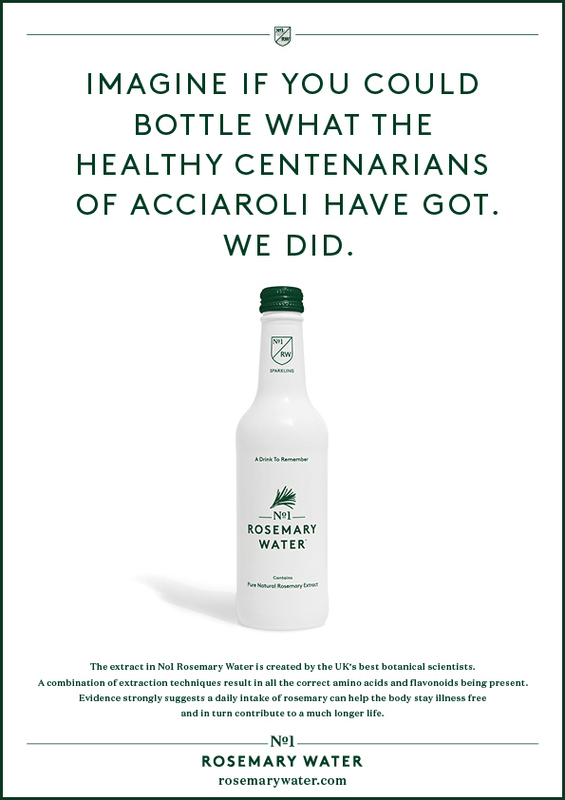 No1 Rosemary Water was inspired by the village of Acciaroli in south Italy, where an unusually high proportion of residents live to 100 – supposedly because of their habit of consuming large quantities of rosemary. Speaking to Campaign last year, the brand’s founder David Spencer-Percival – along with Brotherson – discussed the difficulties of getting across the idea behind the product, while staying within the rules.